This week they had the awards ceremony to recognize those scholars who had scored either proficient (silver medal) or advanced (gold medal) on the The Standardized Testing and Reporting (STAR) Program — The California Standards Test. The students take these tests starting in the 2nd grade until the 11th grade. At Amara’s grade level they are tested in two categories — English Language Arts and Math. It is two weeks of testing in which parents are encouraged to make sure the students get a good night sleep each night and that they start their day with a good breakfast. It is a very stressful two weeks for students, parents and teachers. Parents had been told the results of last year’s testing at the beginning of the school year but they wait to present the awards until just before the testing for the next year begins. Hopefully it will encourage the children to do well. They start testing again in a few weeks. Amara was getting a gold medal for both English and Math! She was so excited she could hardly sit still as was true of most of the students. I was so glad I got to be there. I was thrilled that Jenna was over the flu and could be there, too! We are very proud of our girl. Grampy and Justin couldn’t be there but I took LOTS of videos! The vice principal announced each scholar’s name and the principal placed a medal around their neck. They then went and took their place on the stage to bask in the pride of the audience and each other. The crowd of parents and grandparents was huge as always. They knew it would be so had broken the presentations up into groups so that everyone could attend. Amara’s class continues to have a lot of really serious scholars. 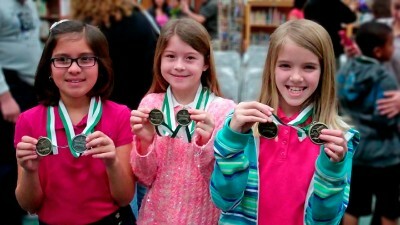 They take a lot of pride in doing well in class, making the Honor Roll and in getting awards. She has such a great group of friends and it is so wonderful to see how proud they are of one another. I loved it when after the gold medal for math was over Amara went running over to one of her best friends who had also gotten the award so that she could give her a high five. Once all of the awards had been handed out the students all gathered on the stage so that lots of pictures (and videos!) could be taken. As I watched those videos again I became so aware of the students clicking their medals together. You can see them doing it in some of the still pictures but you really hear it on the video. They were all so very proud and so very excited. This memory was posted in Special Occasions and tagged Amara, award, school on February 28, 2013 by Grandma Kc. How wonderful to be able to share AND record such a proud moment with Amara! So glad everyone is feeling better and getting back to normal! Congratulations to Amara for her achievements. It was very nice of the school to make sure all the families could attend – good planning. Your opportunity to participate certainly brings up how challenging it is for long-distance grandparents but at least we live in an age of constant upgrades in technology to share these special events. Congratulations to all, but especially to Amara. As a retired teacher, it is so great to see academic excellence celebrated. Yay for Amara! What a fantastic feat. Some are great in English, some are great in math, but to do well in both is truly a reason for awards and celebrations. Congratulations! Sweet, sweet photo of the STAR stars! Uncle Mark and I are so proud of Amara! Congratulations for all the hard work she put into her testing!! Ahh, yes, those wonderful state tests. I’ve been trying to prepare my students all week long. Congratulations to Amara! Once again, what a wonderful accomplishment by a lovely young lady who excels in probably every area of life! I’m not surprised her friends are also high achievers. If I was the parent of a classmate, I’d want her to be friends with Amara so the interest in academics would be maintained. You know…”birds of a feather”…that kind of thing! What a wonderful moment for the whole family. Grandmas has to be so proud!!! She is a cutie! Very nice to find you. I love to see kids doing so well in school. I’m especially excited to see how seriously many girls take their education. I’m confident that these girls will do great things in this world.